Finding ways to live amongst the fluctuations of life is the true essence of life. The story of Bilaspur's Payal Ramteke is somewhat similar. Her husband had brain hemorrhage and he eventually died. Suddenly life started to look intimidating and started to daunt on her and her family. Every day had started to look like a bad dream. The one cloth shop that they owned, did not turn out well. Right then she became aware of the e-rickshaw scheme of the government. She immediately applied for it and her application got approved. There was no turning back for her after that. Payal told that her husband died of brain hemorrhage over a year ago. Their business stalled. The financial situation of the house touched rock bottom. Their everyday routine started to degrade. Problems started to show up. Seeing her son's face used to make her worry about his future. She didn’t know what to do in order to come out of all her troubles. Someone informed her about a vacancy in the textile shop, so she immediately started working there. But, even after burning the midnight’s oil and working very hard, all she used to earn was 3,500 rupees. With that amount of money, they could only afford food for themselves. For the upbringing of her son, she needed more than that amount. That is when, she thought of starting her own business. There were many business ideas but but she did not have enough money to start her own business. Meanwhile, somebody mentioned to her about the e-rickshaw scheme. She talked to her mother and brother at home. After the discussion, they all agreed for it. She applied for the same in the Labour Department and got an approval. 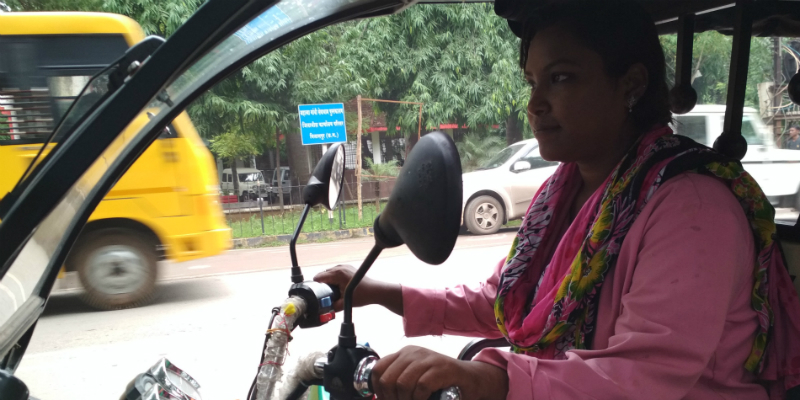 Now, running an e-rickshaw, she earns an average of four hundred rupees every day. She is thinking of providing good education to her son, for his better future. Earning through e-rickshaw also improves her standard of living. There is no such place in Bilaspur where the e-rickshaw wouldn’t have reached. E-rickshaw drivers will always be available at different places like Bilasra Taal, Vivekanand Park, Traffic Park, Ramkrishna Ashram, Smriti Vatika, Kali Mai Temple, Tifra etc. It is also the first choice of tourists. Many women like Payal are taking advantage of the government's scheme and are moving forward. Women's self-reliance has improved the economic condition of the family. Seeing them, men are also being motivated to run e-rickshaws. The Chief Minister himself mentioned about the e-Rikshaw subsidy Yojna. Under this scheme, one-third of the 1.5 lakh rupees worth e-rickshaw’s purchase is borne by the government. Initially started in few districts, this facility is now being provided through DMF throughout the state. Hence the use of e-rickshaw has increased around the tourist spots of Bilaspur. The direct benefit of this is scheme is availed by the poor people who are riding the rickshaw. People interested in buying an e-rickshaw can avail the benefits of this scheme by applying in the Labour Department.